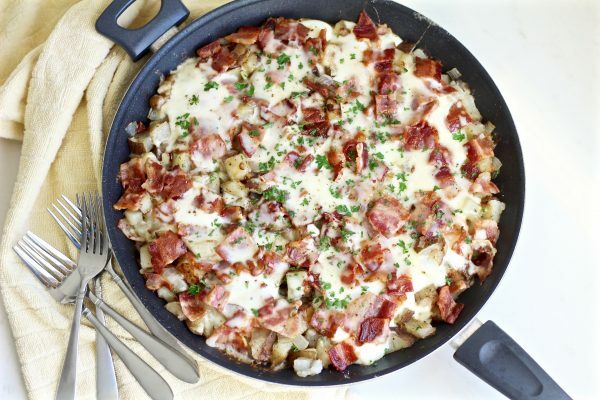 This rustic 5 ingredient breakfast skillet is for all the breakfast lovers out there. To me, breakfast is not only the most important meal of the day but my favorite as well. 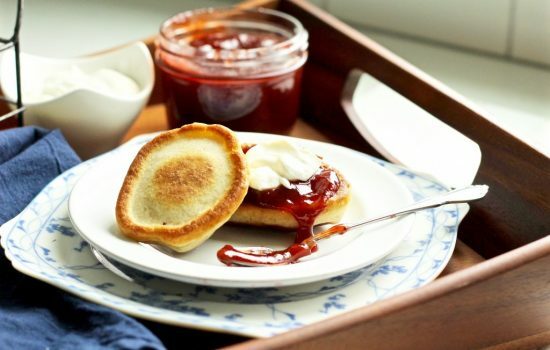 I love the sweet side of breakfast; waffles, pancakes, cinnamon rolls, and muffins. 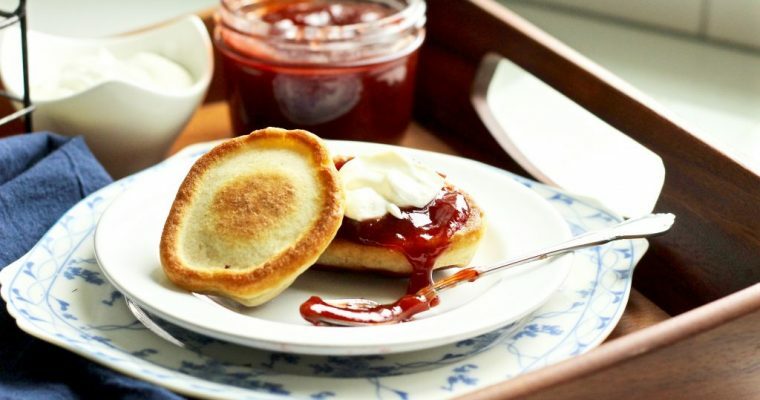 But they are what I lovingly refer to as “breakfast dessert”. And before you can have breakfast dessert, you must have a breakfast entree… or else you’ll end up feeling hungry again an hour later. This skillet is quick and simple to make and uses staple pantry ingredients. 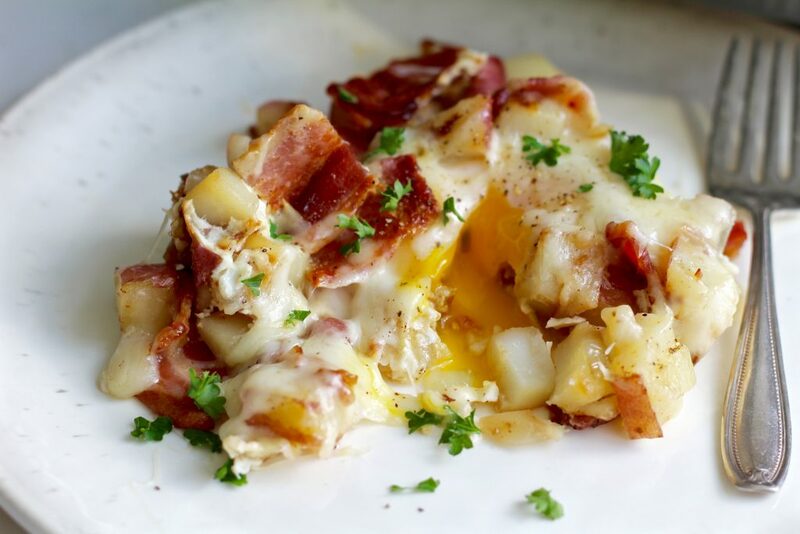 It combines some of my all time favorite savory breakfast ingredients; bacon, eggs, potatoes, and cheese. 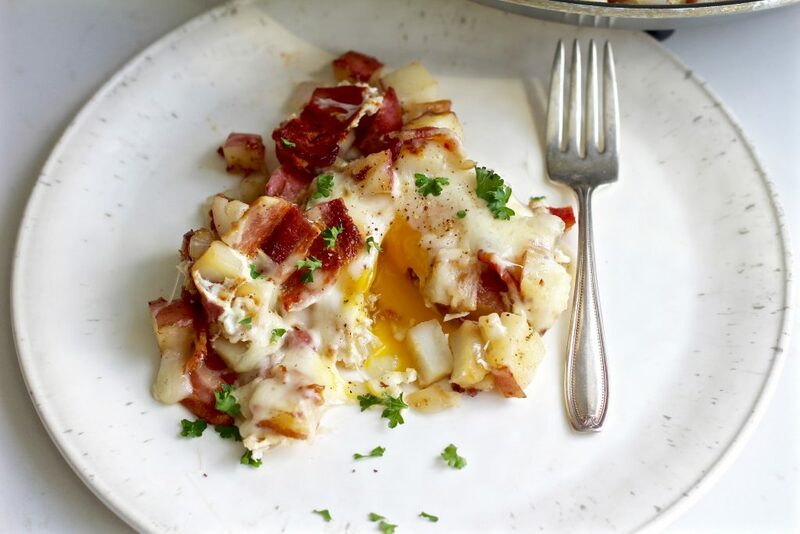 And it’s a great recipe to use if you’re making brunch for a larger group. PS- I love how you can make a recipe extra easy by skipping things like peeling vegetables and plating each individual portion and just call it “rustic”. To whoever came up with this brilliant idea, THANK YOU. Serves 6-9 people (depending on how hungry they are). Cut the recipe in half if you’re cooking for a smaller group. Feel free to add in any other veggies you have on hand for a nutritional boost. 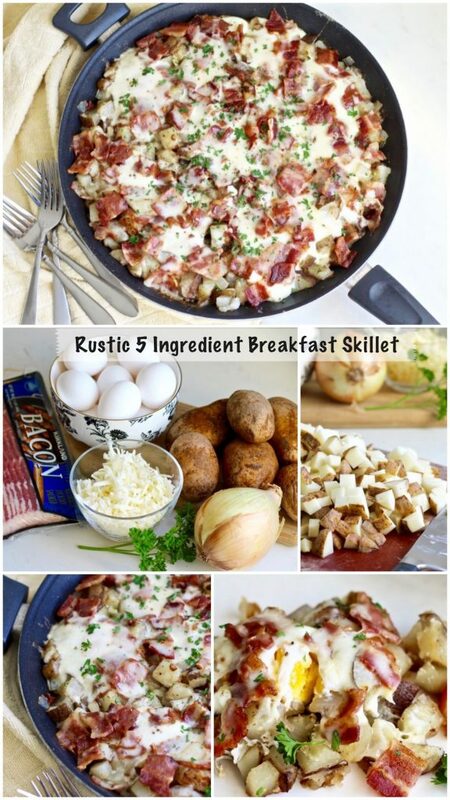 This rustic 5 ingredient breakfast skillet is super versatile! I’ve made it with bell peppers, jalapeños, mushrooms, or sweet potatoes added in. 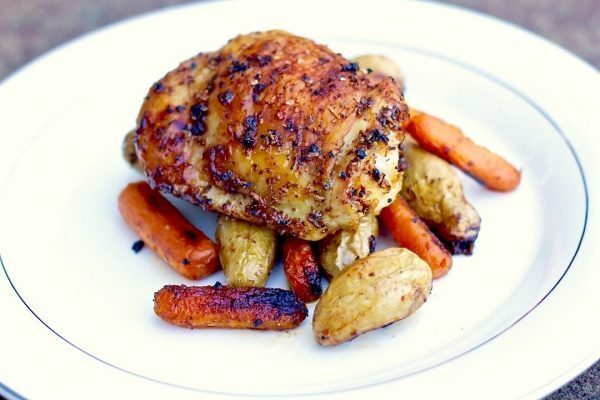 *I highly recommend using a pan that has a lid to make this recipe easier and faster to cook! 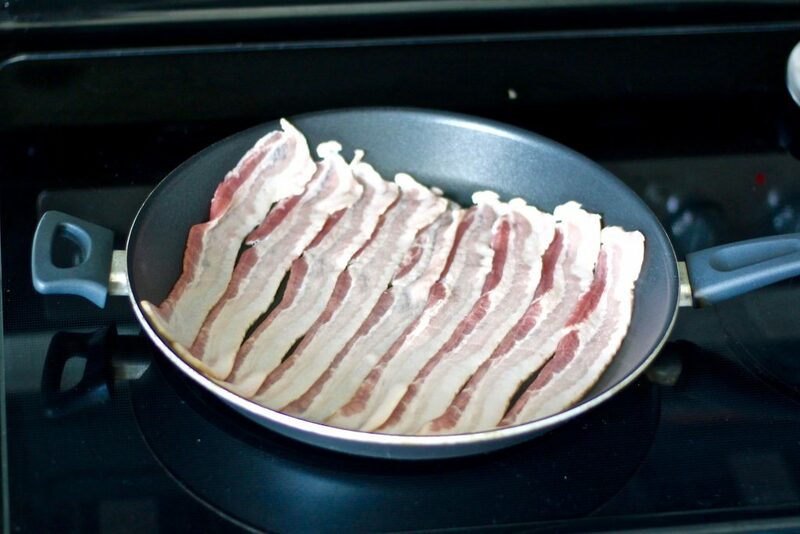 Begin by cooking the bacon (in batches if necessary) in a large non stick pan. Dice potatoes and onion while bacon cooks. 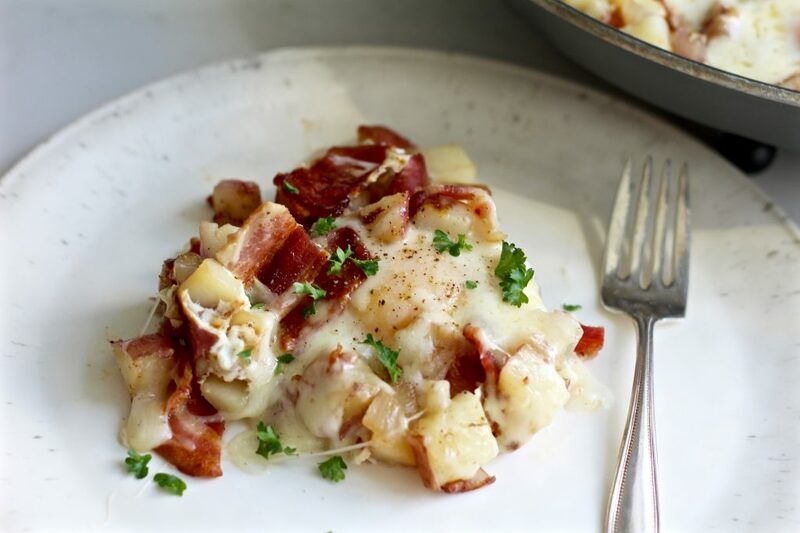 My favorite potatoes are either the red skin or yukon gold potatoes, but since I didn’t have any on hand I used russets. Make sure to scrub the potatoes thoroughly if you’re leaving the skins on. 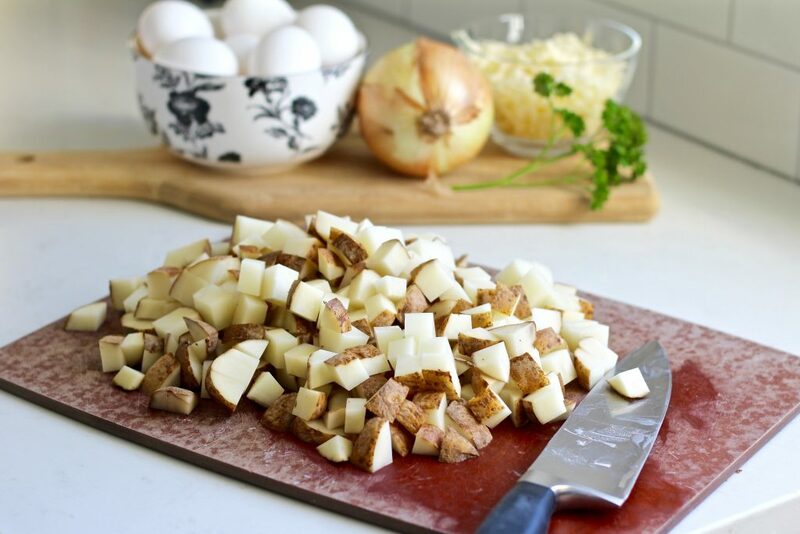 Cut into bite-sized pieces to help the potatoes cook faster. 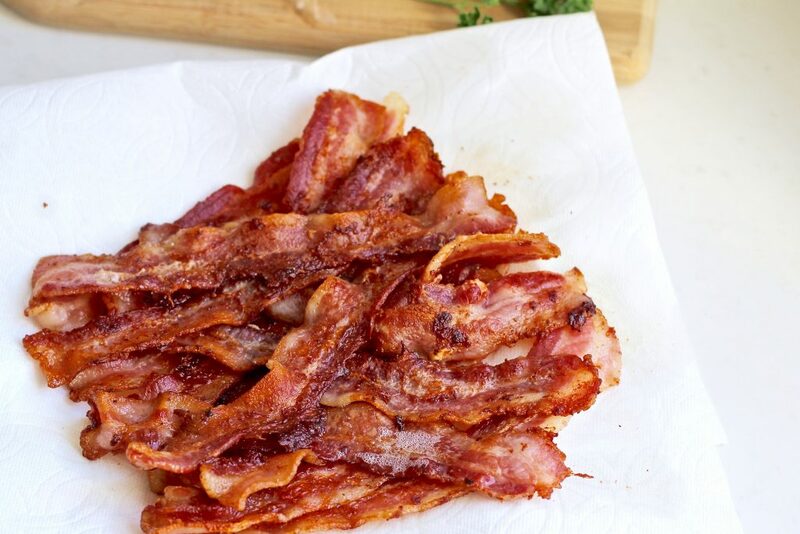 Once bacon is cooked, set it aside on a paper towel-lined plate. 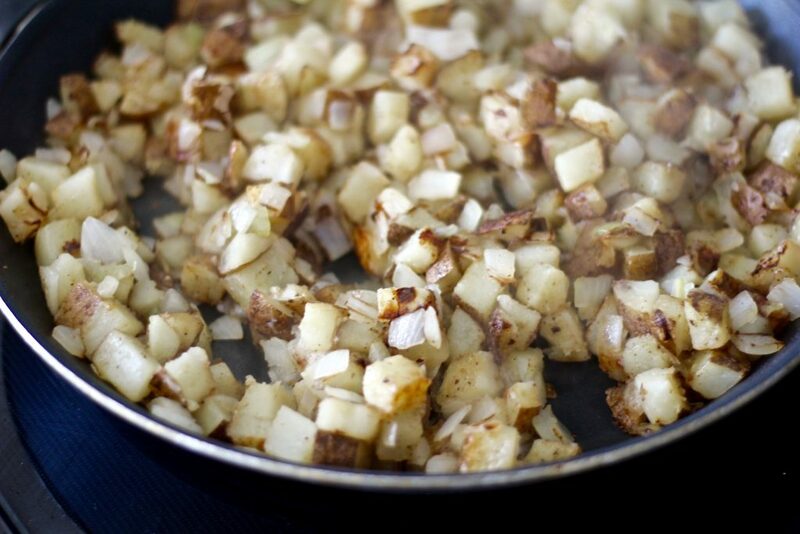 Reserve about 1/4 of the bacon grease and add diced potatoes to the same pan. 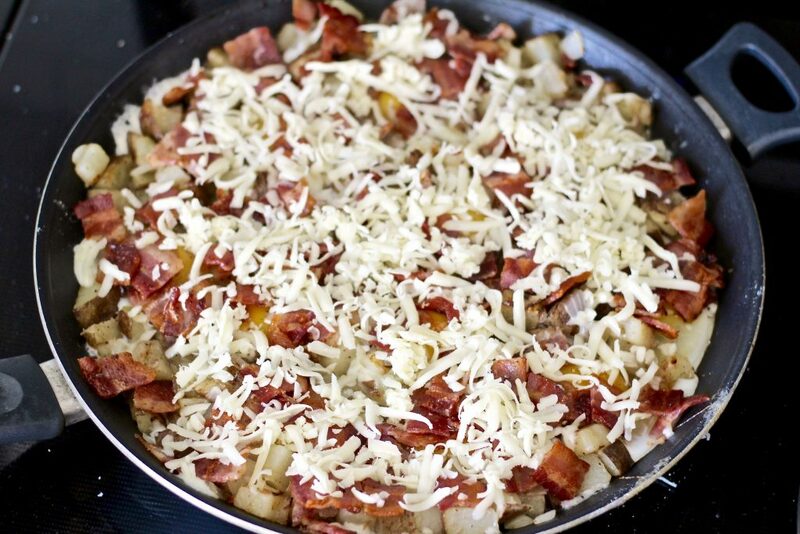 Mix the potatoes in so they are evenly coated with the bacon fat, then add 1/2 cup of water and close the lid. 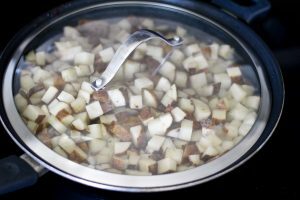 Allow the potatoes to cook for about 5-7 minutes–until most of the water has evaporated, then stir in the diced onion, and season with salt and pepper. Chop the bacon into bite sized pieces once it has cooled. As you can see from this picture, 1 pound of bacon isn’t as much as it sounds like once it’s cooked and you’ve taste tested a slice or two. 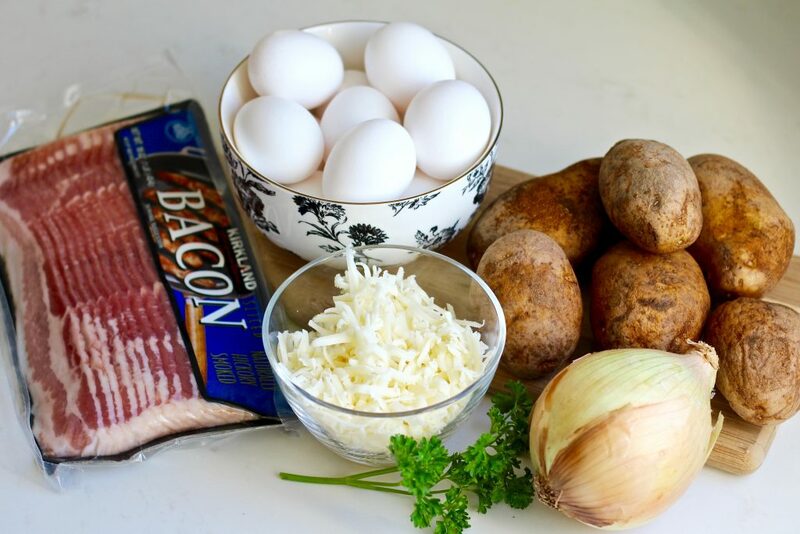 Once onion has softened and becomes translucent, make wells in the vegetable mixture for each of the eggs. I’m being a little ambitious when I call them “wells”. 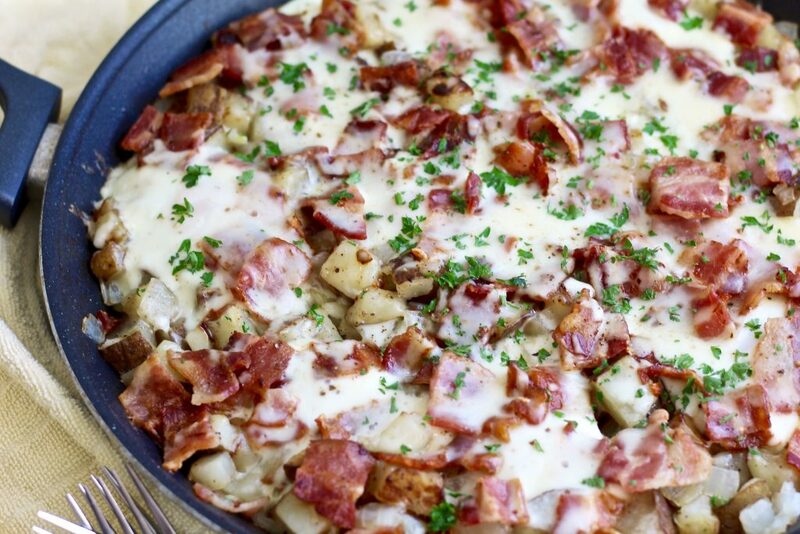 Unless you’re using a massive skillet, it will be pretty crowded with all the potatoes and onion. 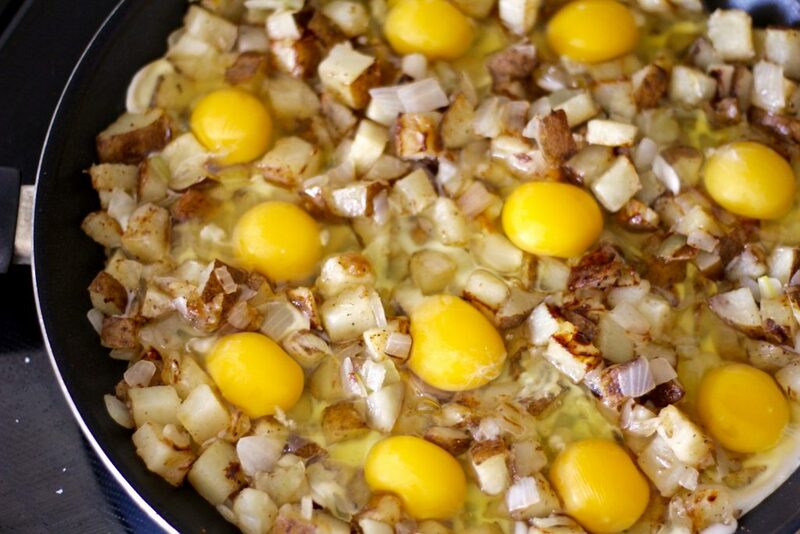 Just move some of the potatoes aside so at least part of the egg reaches the bottom of the pan. Reduce heat to LOW and crack in the eggs. Season eggs with salt and pepper then sprinkle the bacon pieces and shredded cheese on top. 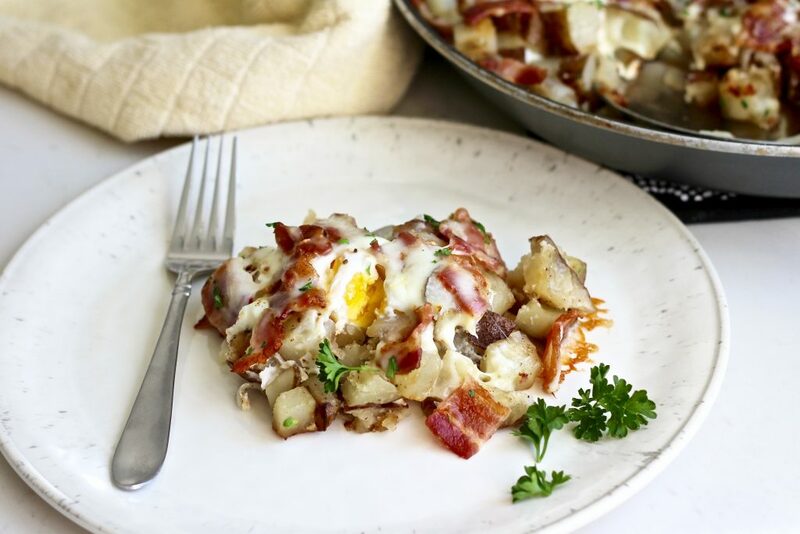 If you are making a half portion of this recipe and have a less crowded skillet, the eggs will cook faster! So adjust this time to about 5 minutes. Garnish and serve family style directly from the pan! Everyone can dig in and choose how many eggs they want and you don’t have to worry about making individual plates (and getting extra serving dishes dirty!). Also delicious with well done, firm yolks for those who prefer it that way! 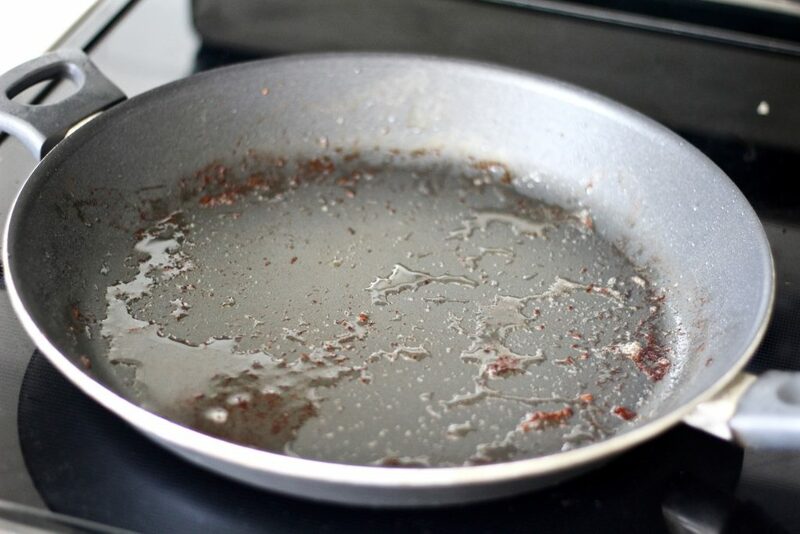 In a large nonstick pan, cook the bacon in batches. Dice potatoes and onion while bacon cooks. 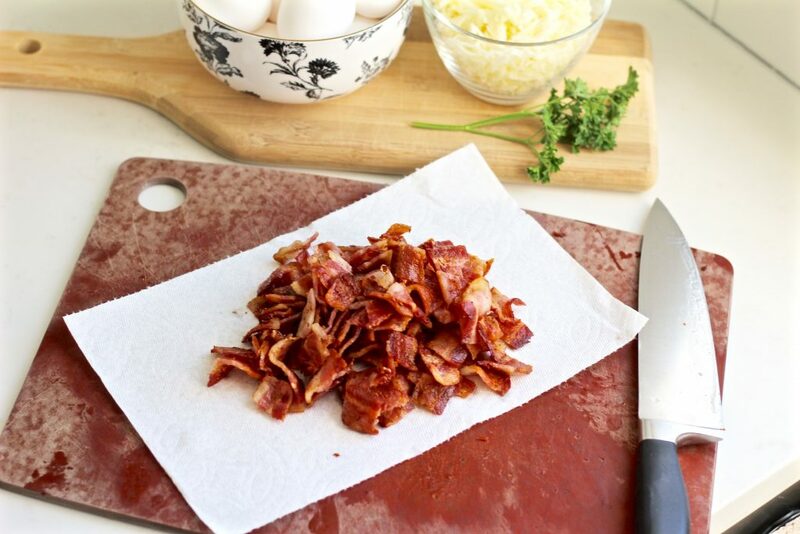 Once bacon is cooked, set aside on a paper towel lined plate. 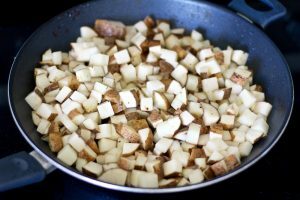 Allow the potatoes to cook for about 5-7 minutes--until most of the water has evaporated, then stir in the diced onion, and season with salt and pepper. Close the lid and allow eggs to cook for about 6-8 minutes (for runny yolks). Garnish and serve family style directly from the pan!